D7 is an advanced repair utility for Windows. Its main features include displaying primary information about the PC on which it resides, cleans junk files, performs stress tests and attempts to repair common errors which may cause performance issues. The program also includes a malware remover, but unlike many one-click solutions, provides intermediate users with ways to manually remove malware components from a PC. It includes tools for cleaning up after malware or software installations gone wrong and more. 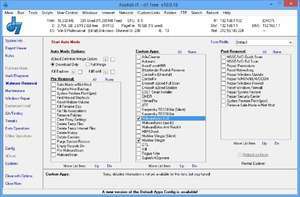 Version 10.4.35 is a freeware program which does not have restrictions and it's free so it doesn't cost anything. For security reasons, you should also check out the D7 download at LO4D.com which includes virus and malware tests. Additional screenshots of this application download may be available, too.